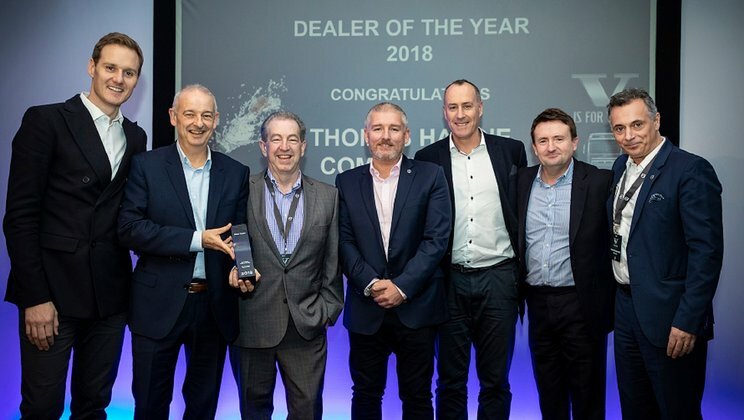 North West England’s Thomas Hardie Commercials Ltd have been awarded Volvo Trucks UK & Ireland’s ‘Dealer of the Year 2018’ at a special Volvo Trucks Dealer Awards event held at the Belfry Hotel in Sutton Coldfield last month. The management team, led by their Managing Director, Jim Murray proudly stepped into the spotlight on stage to collect the much coveted and magnificent ‘Dealer of the Year 2018’ award from Robert Grozdanovski, the newly-appointed Managing Director of Volvo Trucks UK & Ireland together with the event host, BBC TV Presenter, Dan Walker. The ‘Dealer of the Year’ Award is presented annually to the Volvo Trucks dealer who has demonstrated the highest scores in the annual Retail Excellence Survey, coupled with outstanding business growth and customer service in all areas. The judges commended Thomas Hardie Commercials for its ‘impressive sales figures’, which demonstrated strong and continuous growth in addition to its ‘innovative sales programmes’, ‘teamwork’ and ‘ingenious use of social media’, which were also noted. Thomas Hardie Commercials last won this coveted award in 2015.